‘Will you come and follow me’ is from the writing partnership of two leading members of the Iona Community in Scotland, John Bell and Graham Maule. 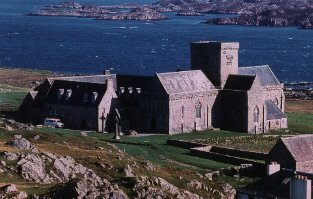 The Iona Community we know today was founded in 1938 by the celebrated Revd. George Macleod, a Church of Scotland minister in Govan, Glasgow. He had a vision of an ecumenical community centred on the restored medieval abbey buildings on the island of Iona. It has been a powerhouse for the Social Gospel movement for the last seventy or so years and has been at the fore in experimental worship and modern hymnody. This liturgical aspect of Iona’s ministry is centred on its ‘Wild Goose’ publications. ‘The ‘Wild Goose’ is an ancient Irish symbol of the Holy Spirit. Over the years its three group members, John Bell, Graham Maule and Jo Love, have produced over fifty resource books and Cds for congregational worship. Much of the material has been drawn from Celtic Christian spirituality and aims to be relevant, modern and participatory. John Bell [born 1949] is a Church of Scotland minister who lives in Glasgow. He is an accomplished musician and lectures all over the world. In 2002 he was honoured by Glasgow University with and Honorary Doctorate and by the Royal School of Church Music. Graham Maule originally qualified as an architect. He later trained to be a youth worker before moving into the area of worship renewal and adult education with the ‘Wild Goose Resource Group’. His particular interests are lay training and innovative worship. ‘Will you come and follow me’ is typical of many of the worship songs to emerge from Iona. It is set to a traditional Scottish melody, ‘Kelvingrove’, and is often referred to as ‘The Summons’. It takes as its theme the ‘Call of Christ’. The Gospels tell us that our Lord called others to ‘follow him’, whether it was the Galilean fishermen who left their nets to become ‘fishers of people’, or his disciples who were encouraged to ‘take up their cross’. Through the centuries, as today, Christ continues to call his saints to a life of faith, prayer and service. ‘Will you come and follow me’ celebrates how the Lord calls us by name so that his life can be grown in us. It is a way of living that involves taking up the cross and to ‘risk the hostile stare’. It is a call to love in action which liberates the captive and blind and which dares to ‘kiss the leper clean’. It is a summons, too, to self discovery and to the faith that can conquer our inner fears. The hymn ends with a prayer for strength to follow and ‘never be the same’. For in responding to Christ’s call to love in action we move and live and grow in him and he in us. Though ‘The Summons’ is a worship song of our generation its call to the Christian pilgrim is a timeless one.